Key Feature – Dario Meets the Entrepreneurial Spirit of Martyn Wood | Marbella Marbella – Adelante! The Costa del Sol has numerous talented interesting personalities living beneath its blue skies, and one of my personal favourite professionals is Martyn Wood, a tall impressive and dignified man with an easy relaxed disposition, a charming smile, tons of patience, but at all times the professional and to this I can testify. I’ve collaborated with him on important occasions and as far as I have experienced, he delivers on the things that he says he can do, which is a valuable asset to anyone using his services. He generously offered his video services freely to help my campaign for Marbella and the UNESCO Rome based charity, “The Children for Peace Onlus”, creating excellent videos for them and from time to time, submits content to our “Marbella Marbella Adelante” website. Martyn born in Ayr Scotland, is a talented video producer, radio presenter, Disco DJ, journalist and a chef, who began his career as a DJ 1972 in Yorkshire when the resident DJ failed to turn up in a club he frequented, from that first time he went on to work in local radio (Bradford), setting up a mobile disco and worked most of the major clubs in Yorkshire including the Warehouse, Leeds. His first foray into video was when he worked at the prestigious, members only “Walton Hall Country Club”, a converted stately hall in the middle of a lake. He was DJ in the disco that was located beneath the lake surface. He directed and starred, along with a selection of members, in his version of the “Tiswas” ‘Bucket of water song’. In 1981 Martyn was the resident DJ in the disco voted “Best disco of 1981, “La Chic Part Two” in Nottingham, and also worked at London’s top disco clubs as guest DJ. From there he came to Spain, contracted to equip a disco in the basement of the Stella Polaris hotel, Torreblanca. After that job was completed, the entrepreneurial Martyn went on to run three restaurants with his wife Nessie (he was chef), until in 1992 when approached to join “Costavision TV” to run the English side of this local TV station, but six months later, with two partners he and Nessie bought the station and set up the first foreign language TV station in Andalucia. For many years he contributed to “The Entertainer” newspaper in the form of the weekly recipe entitled “Chef’s Classic Cuisine”, a feature that was taken up by firstly Radio Mijas as a weekly cookery spot, and then by Onda Cero International radio. Working in TV and on local radio again at this time, as well as in the third restaurant, he decided it was too much and went on to sell the restaurant and concentrate on TV and corporate video production. The TV station was sold to one of his partners and he formed a production company ‘Smithwood Productions’, making English language TV programmes for all the local Spanish stations in the Malaga region. In 1997 Martyn stopped making TV and concentrated on corporate video production and being a service facility to visiting production crews from the BBC, ITV, Channel 4, Channel 5 and many others from all over Europe. He was the video producer of the coasts biggest talent show “The Wow Factor” competition, set up to raise money for Cudeca, and was responsible for all online media promotion. Video on demand was something Smithwood Productions became market leaders in on the coast in the early 2000s. Martyn has been involved in filming many of the major events along the coast including the visit of Queen Sofia, the USS America in Malaga port, “Children for Peace” gala, Starlite gala and numerous inaugurations and openings! 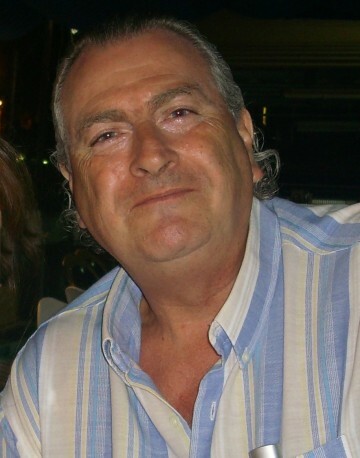 In 2002 He became a founding member of the first Press Club for English speaking journalists, “Club de prensa de la Costa del Sol” and along with Nessie run the website. With the revival of 70s and 80s music in recent years Martyn decided to bring music events featuring this era to the coast and along with Nessie, and partners JC and Chris Jones, opened a live music bar “Le Chic” in the Mijas racecourse in 2010 and with the same partners he ran the American caseta in the Fuengirola International Fair in 2010 and 2011,and he is currently running 70s themed discos along the coast and plans on promoting live concerts in 2013 featuring artists from the 80s. It makes one feel exhausted reading Martyn’s efforts with varying enterprises, but as my father said to me “God helps those who help themselves.” I wish Martyn and Nessie a long happy and successful future.